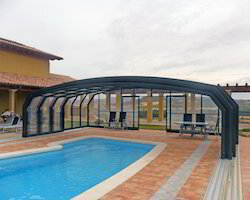 Manufacturer and Supplier of Pool Enclosures. Our product range also comprises of Aluminium Ladders, Polycarbonate Canopy and Fall Ceilings. Consistent innovation, coupled with an alert understanding of customer's needs & demands, makes us the most renowned supplier of Pool Enclosures. Used to keep your pool warm and free from debris so that clients can swim any day of the year, the offered enclosures are manufactured by skilled professionals using advanced technology and quality proven components. Clients can avail the offered enclosures from us at nominal prices.